When it comes to skiing, one thing you really do need over anything else, is snow. You don’t necessarily need a massive amount of it, but there's nothing quite as bad as having a ski holiday with insufficient or poor quality snow! What can guarantee good snowconditions? Weather is unpredicatable at best, especially the last few decades... The impact of climate change is not something many ski resorts want to talk about. There is no question, however, that the c-factor is a force to be reckoned with. Several small low-lying Swiss and French resorts have already become unviable, and for others it is just a matter of time. Snow-sure ski resorts are all about altitude, the higher the resort the better the chance of good snow. Still, there are huge differences between skiresorts when it comes to snowdepth and snow quality. Most resorts claim to be snow sure but quite often this is simply a marketing ploy. Some hide an over-reliance on artificial snow-making. In addition, many ski websites compile lists of snow sure skiresorts which entails in arguable and unsubstantiated claims of the 'snowiest skiresorts'. The rankings never exceed a top ten of usual suspects. Are those lists of snow sure ski resorts based on facts or perception? What about all other skiresorts: how do they compare to a top-league? Skiweather.eu is here to provide you with an honest and unbiased answer to settle this discussion once and for all. We have conductued an extensive and thorough research which took place over the best part of the past 10 years. A massive amount of 7.5mln data records were processed and analyzed. The objective was to rank all skiresorts based on both snowdepth and temperature measured at top and bottom stations. The entire ranking lists well over 450 ski resorts. Please note that ski resorts with a ranking lower than 4.5 might be a risky choice either because of overall poor snow condition, limited skiing opportunities at lower elevation or a short span of operation during the season. That does not mean they are not a viable choice most of the time! In many cases the altitude of the ski resort is in part to blame for a low score, other factors include south-facing slopes, vulnerability due to fohn (northern Alps) and mediterranean or atlantic influence (southern Alps). With it's own micro-climate making things colder and more precipitous than others in the area, Warth-Schrocken averages over 10m of snowfall each year. Long term records taken at just 1600m show a seasonal average of nearly 11m of snow. Up top, this figure is higher still, putting Warth-Schröcken in the same snowfall league as Snowbird in Utah. Even in bad years Schrocken and Warth are snowier than many of it's higher-altitude rivals. Austria’s only purpose-built resort also comes with its own micro-climate and was cleverly positioned just so for access to the finest snow. Long term records reveal a snowfall average in Obertauern of nearly 8m, with the encircling peaks of the Niedere Tauern mountain range causing an ice-bucket effect that keeps temperatures super low. At an altitude of 2300m, resorts don’t get much higher than this. 99% of the ski area is positioned above 2000m which ensures the best quality snow during its long season. 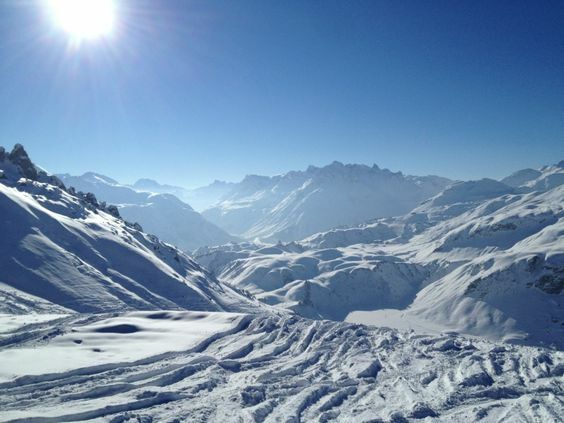 Val Thorens is with a doubt an excellent bet for good snow conditions. Europe's highest major skiresort is naturally one of the continent's most snowsure right from the start to the end of winter. As well as the altitude advantage, Val Thorens also has a high proportion of north-facing slopes and access to not one, but two glaciers. 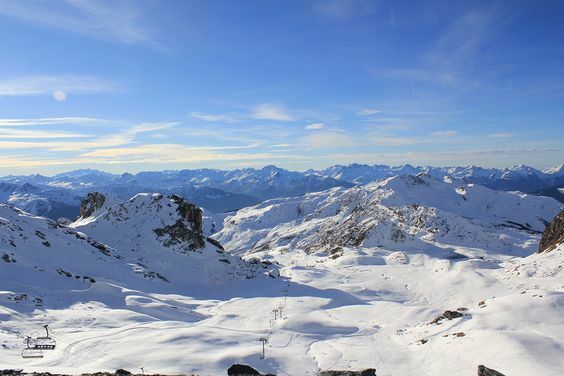 Val Thorens is so confident of its snow cover it offers a snow guarantee. Madesimo enjoys it's location in the sunny Spluga Valley on the Swiss border. The mountains offer snow-sure conditions with the resort based at 1550m and the highest lift just shy of 3000m. Like it's neighbour Tignes, Val dIsere is one of the most reliable resorts in Europe for good snow. Historically, 'Val' has always been picked by the FIS to host one of the early season World Cup races, the simple reason being that there is generally more chance of having snow here than elsewhere in Europe. Located in the famous Arlberg region and sandwiched in-between Lech, Stuben and Sankt Anton -which are all very snow sure resorts- Sankt Christoph adds altitude to the equation. Settled in front of the Flexenpass at an altitude of 1740m it is one one of the best destinations for early or late season skiing in Austria. Peisey Vallandry and La Plagne are part of Paradiski; one of the largest ski areas in the world and its runs extend to 3000m including glacier skiing, so it is a safe bet for skiing at either end of the season. If you are concerned about being able to ski to your apartment door however, be sure to choose one of La Plagne's altitude resorts if visiting in December or April. Altitude resorts are as high as 2100m, some of Europe's highest. Tonale is a high-altitude resort perched in a wide, open expanse that is both snow-sure and sunny. It is actually one of Italy's highest resorts and is guaranteed good snow and a long season. Presena is the glacier just south of Passo Tonale which sits at over 2700m, so this coupled with the generous snowfall makes Tonale the perfect spot for powder seekers. Incidentally, Tonale is one of the cheapest snow sure destinations. Contact us if you are listed in our ranking and want to obtain your skiresort's snow guarantee badge. Join our skiresort representative network and submit snowreports on a regular basis to our fanbase, partners, and followers on social media.